Reports came in on the 7th of April the Bashar al-Assad’s regime had once again used chemical weapons against its own people. It estimates that so far 40 have been killed. The attack took place in Douma; a rebel-held town. Whilst the Russian-backed Syrian government refutes the claims, Russia (as with the UK Chemical attacks) claims the attacks were staged. Douma came under attack in February when President Bashar al-Assad launched an offensive on the area. The attack is estimated to have killed 1700 civilians. In March Assad’s troops split the region into three enclaves- the largest being Douma. The Jaysh al-Islam group controlling Douma resisted the Syrian troops advance. The next stage was negotiation which stalled before airstrikes resumed on the 6th April. Whilst the rest of the world attempted to process and ascertain exactly what had happened President Trump took to his favorite mode of diplomacy – Twitter. His latest Twitter tirade began with him advising Russia to get ready for the US-led attacks on the Syrian regime. The world correctly becoming anxious a sentiment which was conveyed in downward stock market movements. With Russia being directly named in an assumed threat instantly harped back to the era of the missile crisis. Whilst some may applaud Trump’s decisive approach, the world awaited the next move with many finding the Tweets inappropriate and tremendously dangerous. The worry remains how the Kremlin will interpret and react to Trump’s hostile statements, especially as they, publicly at least called for a resolution in Syria. President Macron and Thresa May also stood side by side condemning the chemical attacks on Douma. The French President, UK Prime Minister and Trump confirmed that there would be a response to the assaults and a flout of the ban on chemical weapons would have ramifications. Three separate conference calls took place between the leaders who agreed on an international united front against the Bashar al-Assad attacks and his supporters. Notably, Russia and Iran who appear to continually defend Assad’s illegal offense. Its understood that following the attacks Theresa May received a lot of pressure from the Senior Tories to collaborate with US-led military intervention. President Macron, arguably the better informed has since confirmed he has evidence of the Syrian army using chlorine in attacks. Previously Macron had confirmed that any air strikes would be targeted on Syria’s chemical abilities presumably including labs and chemical stockists. Friday evening saw the first wave of Airstrikes against three Syrian targets which are believed to have played a large part in the attacks in Douma. It is estimated that roughly 100 missiles were unleashed upon the targets. The campaign which was led by the US with strategic support from the UK and France. The three nations have since received support and criticism from numerous countries and alliance. Saudi Arabia, Turkey, Germany, European Union and NATO offering verbal support in one way or another. The strikes also attracted a number of critics including China and Indonesia. Iraq also warned that the attacks could offer terrorism the chance to expand in the region and warned of the consequences. The United Nation who had previously called for restraint worried that the situation could quickly escalate. The supreme leader of Iran Ayatollah Ali Khamenei was quick to confirm the strikes as illegal and claimed that as in Iraq and Afghanistan occupations, the strikes would inevitably fail. As did the many of the worlds Indexes, the Russian Ruble has tumbled dramatically this week following its reported collusion and indirect support of the Syrian chemical attacks. This week has marked the worst week for the Russian Ruble in nearly three years. The downturn began following the Chemical attacks which took place in Salisbury and prompted sanctions from a number of countries. 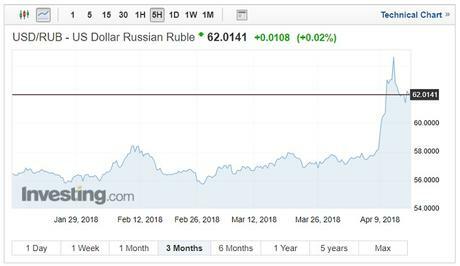 Since the US implemented its sanctions on the 6th April the USD/RUB has spiked significantly with the pair touching a high of 64.29 (11-4-2018) moving from stable trading ranges of between 55.73 to 58.41 over the last 3 months. The recent tensions and Russia’s apparent continued support of the Assad regime despite the chemical attacks sending the currency pair skywards. Russia’s finance minister also confirmed on Tuesday that it scrapped a planned Russian bond sale amid growing tensions and pressure from sanctions. In total the Ruble lost over 10.3% this week, briefly breaching the 65.00 level, this hasn’t been seen since 2016. Safe haven currencies benefitted with the Japanese yen appreciating against the US Dollar, benefitted by a 0.4% gain following the Trump’s tweet warnings to Russia. Bizarrely, the Swiss Franc was unable to gain, the typical safe haven falling throughout the week. Let’s not be flippant Russia and the US at loggerheads isn’t great for anyone, especially the Syrian people who have suffered for years with little international intervention. The scenario is grave and the fact that the US isn’t backing down shows real intent or misguidance on the Presidents part. The UK also have also been victims of Russian covert attacks with nerve agent being released in public areas and restaurant in Salisbury. Arguably of all parties Russia has remained the tightest-lipped with ambassadors saying that they would intend to shoot down missiles aimed at Syria and could possibly retaliate. The world will be hoping for a resolution and with the elimination of Assad’s chemical weapons which may be likely. Trump has often vied for improved relationships with the Kremlin, this, however, would be unlikely if any Russian personnel were caught up in the strikes or any other military action. Gold prices have taken off following the troubles with the ounce price rising from $1326.90 to a high of $1353.49 from the 5th to the 11th April. In recent days pricing has eased however, one would expect another rally following the airstrike as markets try and find their feet and politicians attempt to quell any fallout.